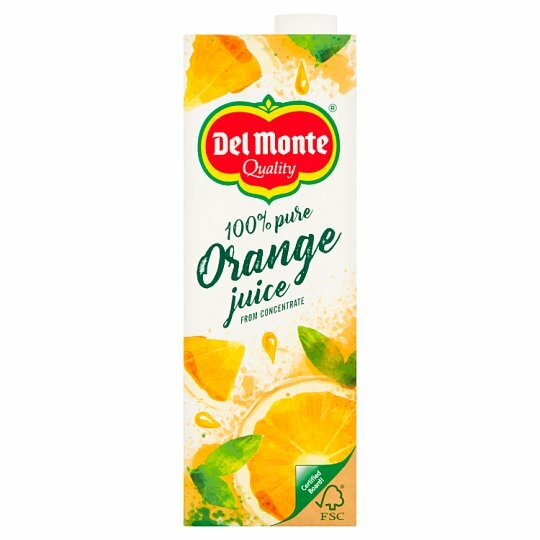 One 250ml Glass of Del Monte Orange Juice counts as one of your daily portions of fruit and vegetables as recommended by the World Health Organisation. It also counts towards your hydration target of 8 glasses of fluid a day. Everyone in the Del Monte family is passionate about juice. From our growers in distant plantations to the specialist bottlers who make it just so, we're all determined to bring you the tastiest juices possible. Our secret? We use sun-ripened oranges that are hand-picked only when they're bursting with the most flavour. That's how we capture a taste that's as delicious as the day the fruit was picked! For more than a century Del Monte have been the fruit experts. And we're still as passionate and enthusiastic about making quality juices as ever. That's why we know you'll enjoy this drink as much as we enjoyed making it for you. We only say yes to the best... so you can too! The man from Del Monte has been busy, searching the world for the finest fruit... The result? Our tastiest range ever! So why not enjoy the fruits of the Man from Del Monte's labours and pour yourself a delicious glass of 100% Pure Orange Juice. Once opened keep in the fridge and enjoy within 4 days. We think our juices taste best when served chilled. Shake well before opening.